This is a sponsored post written by me on behalf of Hallmark Gold Crown. All opinions are 100% mine. We just picked up our family Christmas cards for this year and I know it’s only a matter of a few days before the holiday mail starts coming and we start receiving all of our holiday cards. Now as a craft blogger I’m a little disappointed in myself because the last two years I’ve displayed my cards with washi tape, I know it’s not very creative but at least it was Christmas washi tape. This year I wanted to get a little crafty and make something to go along with our holiday decor! I’m so excited to partner with Hallmark Gold Crown to bring you some fun holiday crafts with the first one being this easy and inexpensive chalkboard Christmas card holder. 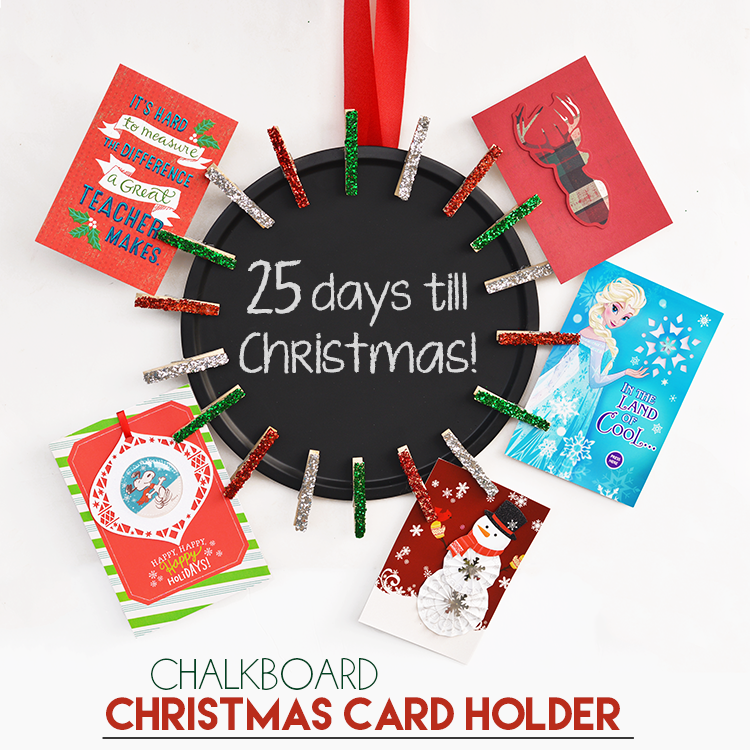 The kids wanted our chalkboard to be a Christmas countdown but you can do whatever you’d like for this craft. When you think Christmas cards you automatically think Hallmark, and their cards are more than just a piece of paper. They tell a story, a joke, some are ornaments, some even light up and play music. My kids love opening Christmas mail and I love seeing their faces light up when they do. My son’s favorite is the Snoopy Christmas card below that features a holiday ornament placed on the cover of the card. And of course, my daughters favorite is the light up Frozen one that plays “Let It Go” and has been playing it over and over and over again since she’s opened up the card! Instead of just taping these up on the mantel, placing them in a drawer to never be seen again, or stringing them up in a room, we’re sharing an easy DIY Chalkboard Christmas card holder to display all of your gorgeous holiday cards this year. Small Pizza Pan – I scored one for $1.00 at a department store! 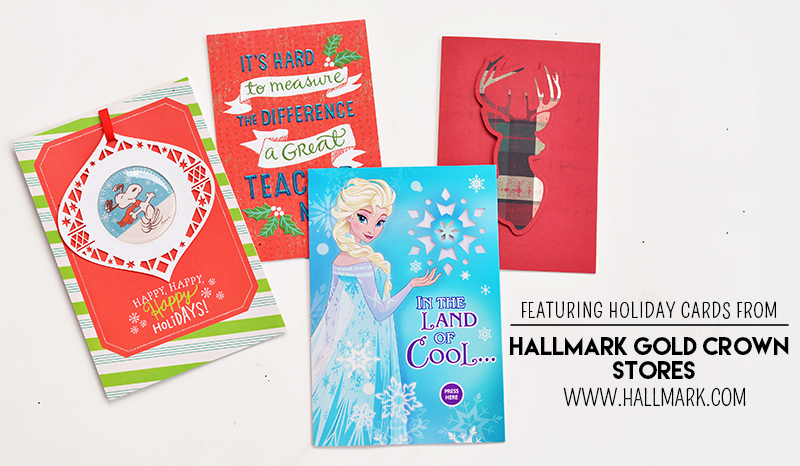 and of course your gorgeous Hallmark cards! Play the video below for the tutorial.